We just love the corn tortillas hat Trader Joes sells. They have four ingredients (corn, lime, water and salt). We usually have quesadillas once or twice a week even though it isn’t paleo! It’s easy and on school days or busy days it’s fast and easy and ready in seconds and is always a hit! Last week we didn’t have them at all and the tortillas sat in the fridge for a whole week! They got a little dry and then started to crumble. They were definitely not fit for making quesadillas with them. As many of you well know, I don’t let much go to waste, so I HAD to find another use for them! 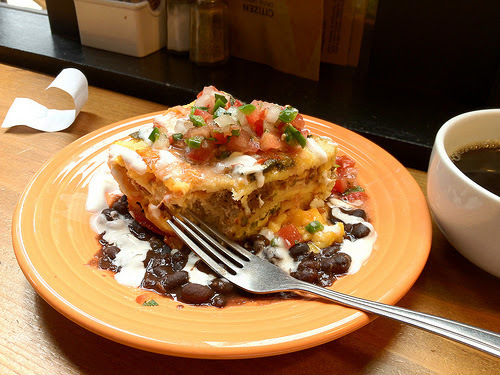 Enter… Southwestern Breakfast Casserole!!! The kids and I LOVED it, but hubby wasn’t quite as enamored. He isn’t one to really get that excited about any kind of casserole. We don’t have them very often and most of the time casseroles in general really are not that healthy and use a lot of dairy ingredients which we can’t do! So with a little of this and a little of that and some extra special ingredients from our pig we purchased last year we came up with a keeper recipe! The jowl worked perfectly in this recipe and was super delish. If you don’t have it, then you can certainly sub out bacon or sausage, but I will say you will be missing out! Give it a try… and as always… please give me some feedback and let me know what you think! Saute til cooked and remove from pan. Saute onions, peppers and chilies in the leftover drippings in the pan. Take 3 of the corn tortillas and line the bottom of a 13X9 baking pan. Beat the eggs and almond milk together. Let soak overnight for breakfast, or let it sit for a few hours before serving for dinner. Bake for 1 hour at 350 or until eggs are set. Mmm! Might have to make this again this week!